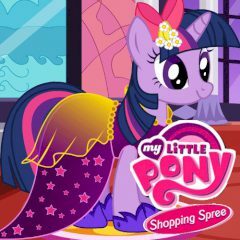 The heroes of My Little Pony love fancy and beautiful clothes. You would not say that, if you look at them. This shopping spree will show their addiction, but their money is not enough to buy everything they see. The ponies never miss a chance to go for a shopping. When they get their salary it means, that it will be a real shopping spree the next day. Choose your favourite pony and visit all shops in the valley, purchase all clothes and accessories you like, but make sure you will have enough money on everything. Check your look in the dressing room and have fun!